"This comes up like clockwork every year around Halloween across the country at different colleges," Katheryn Russell-Brown, UF law professor and director of the Center for the Study of Race and Race Relations, told the newspaper. "What we're talking about is not so much whether people can do this … but what message it sends and what kind of community we want to have," she said. The individuals wearing the costumes said they made "a very ignorant and poor decision" and they weren't aware of the history of blackface. "At no point in time were we ever trying to negatively portray African-American stereotypes," they said in a statement. 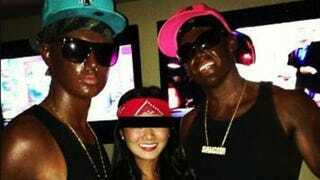 "We have since learned about the history of ‘blackface' and fully understand how our actions were insulting to the African-American community." Look! Thinking and learning! Faith in America’s youth restored. Until next year.